Being involved in a car accident that causes injury or the untimely death of a loved one is a tough thing to process. Dealing with medical bills, lost wages, insurance claims, and the emotional trauma can overwhelm you. 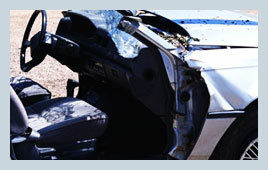 Whenever you are in a serious accident, it is best to contact a Lewisville personal injury lawyer to assist you. Steele Law, P.C., will take on that stress for you so you can focus on your health. Before doing anything else, get medical treatment from a healthcare provider. Injuries from car wrecks often seem minor…at first. However, without proper medical care and supervision, they can worsen over time into chronic conditions that may require multiple surgeries. There are differences between the injuries typically caused by rear-end and head-on collisions, as well as differences in the medical needs of a person living with a neck or back injury. We believe that attorneys who say they can help manage clients' medical care are selling a false bill of goods. Our job is to take on the burden of the legal questions that arise after a crash and tackle the insurance company, so our clients can recover the money they need to rebuild their lives. We can calculate the value of your damages. A skilled attorney will analyze your injuries and vehicle damage, and put a value on your pain and suffering. We also know how insurance companies work and can negotiate your settlement. We understand the legal process. Knowing the exact documents to file and how to properly fill them out is extremely important. No matter how prepared you are, if you’re unfamiliar with the claims process, it can harm you in the end. The last thing you want is for the insurance company to find a legal loophole that will cheat you out of thousands of dollars. We are motivated to help. Aside from the fact that we genuinely want to help you recover, it may be comforting for you to know that we don’t get paid unless you do. If by some chance the case doesn’t go as planned, you won’t have to worry about paying any legal fees. This also ensures that your case will be handled as swiftly as possible and we will always work to get you the maximum settlement. We can improve your odds. Insurance companies will do all they can to get you to settle on the lowest offer possible. They will have tough defense lawyers on their side, but we know all their tricks and give you leverage for a better outcome. We can take your case to trial. Insurance companies avoid going to trial at all costs. They are aware that if they go to trial, the jury is likely to side with the injured person and they will have to pay out a higher amount plus legal fees. Having a lawyer lets the insurance company know that you can fight them in court if necessary - to avoid this, they’ll give you a better offer. We represent people injured in accidents caused by inattentive drivers distracted by cell phones, or drivers who are reckless. We also handle other types of motor vehicle accident cases, such as rollover accidents, truck and bus accidents, motorcycle collisions, and drunk driving accidents. We can address insurance denial issues, and clearly explain what to do after your auto accident. Whether your accident resulted in whiplash or an amputation, we can help. "I was involved in a serious auto accident in 2002. The incident and the frightening ambulance ride to the hospital that followed are forever ingrained in my memory. I have permanent scars from the serious injuries I sustained. I went through multiple surgeries and years of continuing treatment in hopes of repairing some of the damage that was done." We will stand by your side to help you get the compensation you need to cover medical bills, lost wages, pain and suffering, and other expenses. We have been serving our fellow Texans in the Dallas-Fort Worth area for two decades. If you or a loved one has been injured in an accident, give our office a call today for a free consultation at (214) 333-9393. The State Bar of Texas has placed limitations on an attorney's publication of the amounts of settlements and verdicts reached in a particular case; therefore, the specific settlement or judgment amount is not listed for these representative cases.